Gibson revamped their ES100 model after World War II and renamed it the ES125. 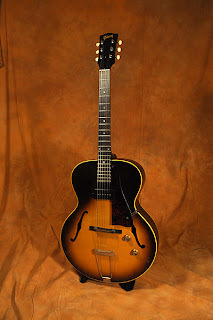 Upgraded with a more modern P90 pickup and a 16 1/4" hollowbody, the ES125 proved quite popular as an entry-level archtop in the Gibson line. 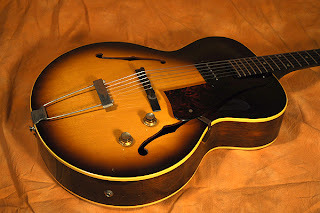 This particular Gibson ES125 from 1964 shows off the sheer simplicity of the design -- button tuners, unbound rosewood fingerboard with dot inlays, non-laminated tortoise shell-style pickguard, a volume and tone control, single 'dog ear' P90 pickup, trapeze tailpiece and Gibson's standard 24 3/4" scale length. The ES125 remained in production until 1970. I've a played few ES125's in the past and every one had that vintage mojo -- not surprising for guitars that were all 50 years old.